ConnectWise is a business process automation platform that allows your business to sell, service and support technology more efficiently and in a more streamlined way. The business management tool allows your business to centralize all information, automate business process, real-time visibility in operations, and provide better customer support. ConnectWise has a CRM, ticketing system, help desk, and tools for project management, billing, and procurement. The business tool also has reporting and dashboards and uses over 300 third-party integrations. ConnectWise gives businesses a complete business management and process automation platform for technology companies including IT service companies, professional services, software developers, security, and telecom. The workflow rules that are defined in ConnectWise cover various areas of the business, ranging from conducting targeted marketing campaigns to monitoring service delivery using service level agreements. The app can also be used for ticket management, help desk management, project management, customer relationship management, time tracking, asset tracking, billing and invoicing, technician dispatching, procurement, inventory management, among others. ConnectWise offers businesses an efficient solution to streamline IT and ITIL, using automation options for availability management, request management, incident management, service reporting, service asset as well as configuration management, change management, service-level management, and knowledge management. The tool’s customizable dashboards and reporting features give you detailed insight into the most critical KPIs. The tool also comes as a mobile app for handling service requests and access crucial data on-the-go. You can use the tool’s smart contract management to handle service contracts with agreement automation. You can automate invoicing from your service ticket data and sync important payment details from your company’s accounting system. You can create workplans and project timelines and get detailed reporting on progress of projects. It’s also possible to use the workflow engine to manage deadlines and get notifications of overdue tasks. It includes a ticketing system using workflow automation, SLA, as well as performance monitoring and access tickets from mobile devices. Dashboards of the tool show overviews and detailed explanations of KPIs. Your business can also use the custom report writer to generate reports on whatever issue you want. You can use ConnectWise to automate the range of ITIL process, such as: incident management, availability management, change management, service reporting, service-level management, service asset and configuration management, request management, and knowledge management. Each enterprise has different wants and needs a software that can be customized for their size, type of workers and clients, and the particular industry they are in. For these reasons, no system can provide perfect functionality out-of-the-box. When you search a software app, first be sure what you want it for. 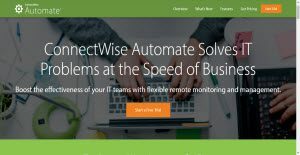 Read some ConnectWise reviews and ask yourself do you need basic tools or do you want sophisticated functionality? Are there any industry-specific features that you are seeking? Obtain the answers to these queries to aid your search. There are plenty of elements that you need to reflect on and these include your budget, particular business requirements, your company size, integration needs etc. Take your time, check out a few free trials, and finally select the platform that provides all that you want to boost your company efficiency and productivity. How Much Does ConnectWise Cost? Since no two businesses are exactly the same. ConnectWise Automate® is designed to meet the unique needs of your business and prices are customized based on your needs. Vendor will tailor a quote specifically for you. Get in touch with the vendor directly to get a quote. We realize that when you make a decision to buy Project Management Software it’s important not only to see how experts evaluate it in their reviews, but also to find out if the real people and companies that buy it are actually satisfied with the product. That’s why we’ve created our behavior-based Customer Satisfaction Algorithm™ that gathers customer reviews, comments and ConnectWise reviews across a wide range of social media sites. The data is then presented in an easy to digest form showing how many people had positive and negative experience with ConnectWise. With that information at hand you should be equipped to make an informed buying decision that you won’t regret. Devil in Details. Connectwise is NOT Manna from Heaven as they Convey. What are ConnectWise pricing details? What integrations are available for ConnectWise? Pros: Scalability and detailed tracking of service/project items. Cons: CW chat is relatively quick but those agents cannot actually see your system (according to the last agent I chatted with) to provide any real support. How to guides are available and easy to use for identifying normal use and setup issues but not for fixing problems.True technical support is nearly impossible to get when it matters most. Pros: Best aspects of the product is it has a very good Training through University of Connectwise so on boarding employees is easier and a good experience. Cons: Purchased the On-premise version. Found out after the 120 day satisfaction guarantee that this Product provides NO SLA to their customers who have an SLA with there clients. Thereby, when a Tech company has a tech issue with Connectwise, resolution of the problem is slow, cumbersome to try to get the right person that can help fix the problem. In essence you have to go through the Tier One Comcast call center first before you can get to someone who can help. Best aspects of the product is it has a very good Training through University of Connectwise so on boarding employees is easier and a good experience. Scalability and detailed tracking of service/project items. If you need more information about ConnectWise or you simply have a question let us know what you need and we’ll forward your request directly to the vendor.